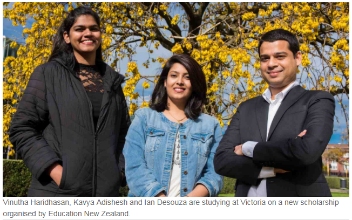 Mumbai: Vinutha Haridhasan, Kavya Adishesh and Ian Desouza arrived at Victoria in Trimester 1 and are part of a group of 35 top students from India to receive the New Zealand Excellence Scholarship. The scholarship is jointly funded by ENZ and eight participating New Zealand universities including Victoria. Their scholarships, worth $5,000 each, allow the students to study in New Zealand at postgraduate level in the fields of business, fashion, science, technology, engineering or mathematics. Vinutha, who is studying a Postgraduate Diploma of Professional Accounting, says she chose Victoria for its international reputation. She’s hoping her new qualification will lead to a job so she can stay on in New Zealand. Ian comes to Victoria as a mature student already having a Bachelor’s degree, a Postgraduate Diploma in Financial Services, and six years’ experience in the sector. He took up the opportunity to study at Victoria to further his studies while learning about another culture. Kavya is studying a Master of Professional Business Analysis at the Victoria-led Wellington ICT Graduate School. “Studying at Victoria has been pretty good. In India, study was mostly theoretical, whereas here I get to apply theories and knowledge practically. The scholarship programme provides a pathway for India’s top scholars to gain a world-class education in New Zealand while also strengthening ties between the two countries. Victoria’s International regional manager Isaac Brosnan says he is “thrilled” with the calibre of the scholars.